Dry eye is a condition that occurs when a person’s eyes have insufficient tears or poorly made tears to properly lubricate the eyes and the eyelid. Without the natural lubrication and cleansing of tears, a sufferer may experience a feeling of grit or debris in the eyes, blurred vision, tired eyes and sensitivity to light. Their eyes may appear reddened and inflamed. In extreme cases of the condition, chronic dry eye can result in increased eye infections and scarring of the cornea. 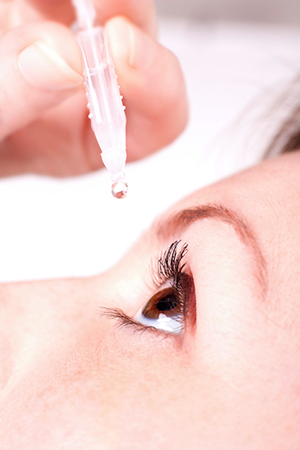 Many diseases, disorders of the eye and side effects of medication can cause dry eye. Essentially, dry eye results under conditions in which too few tears are produced or evaporation of tears takes place too quickly. Quality tears are not simply salt water, but are made of three different substances — mucin, water and oil — designed to work together in proper proportions. The mucous layer lies just above the eye surface and helps the tear “water” spread evenly across the entire eye surface quickly and with each blink of the eyelid. The oil portion floats above the tear layer and not only helps lubricate blinking, but also actively slows down the rate of evaporation of tears from the eyes. Any interruption in these layers or their proportions can result in dry eye. Your eye care provider will discuss treatment options with you that depend upon how seriously the problem is affecting your life and if complications are likely to occur. Treatment may consist of adding tears with over-the-counter “tear drops,” prescription medication to take by mouth that will increase your tear production and even introducing omega-3 fatty acid nutritional supplements into your diet. Sometimes, surgery can help. One type of surgery — a temporary or a permanent form — plugs up the tear ducts so that tears cannot drain back into the body.